Marcello has a degree in Physical Education and Postgraduate in Sports Training and Exercise Physiology. 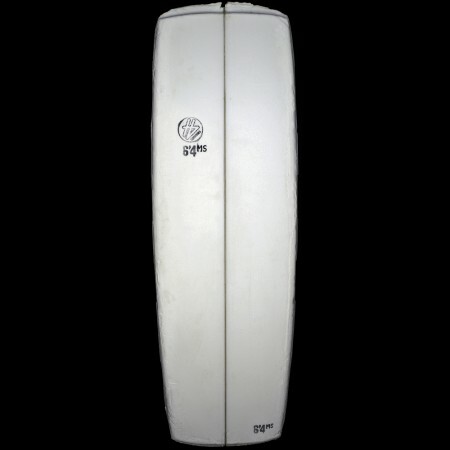 Santos surfer since 9 years and shaper from 17 today to 42—a lot of experience as a professional shaper . 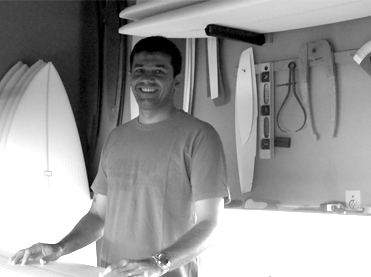 During his 25-year career as a shaper, he studied with Silvio Zampol and Almir Salazar. Thorough and careful in their work, always striving for perfection in the drawings and measurements, but also in the creation of bold lines. Marcello is one of the shapers of mega factory New Advance, there had opportunity to ” shapear ” to Picuruta and Leco Salazar , and many others who passed through there . This stick was a custom and the customer couldn’t afford it when it was done. My loss is your gain! 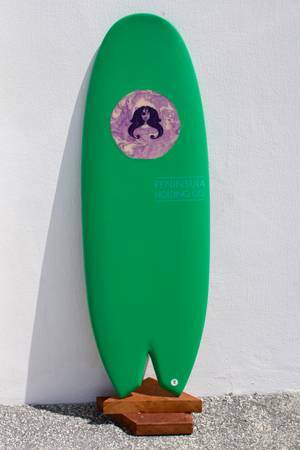 The perfect summer board for the east coast, super fast and can fit in the smallest of our beach break pockets. Reinvigorate these lazy days with a high performance space ship. 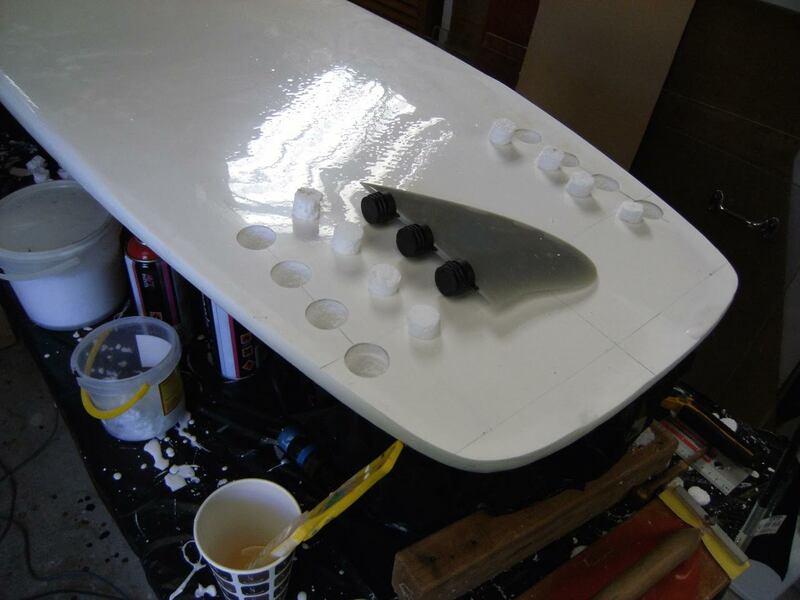 This board is an all epoxy construction, and is a true piece of art as well as a super functional surfboard. Please let me know if you have any questions. I am the shaper, and I would love to talk to you about it. Please feel free to message me with any questions! It’s about time someone started making Mini Simmons blanks. 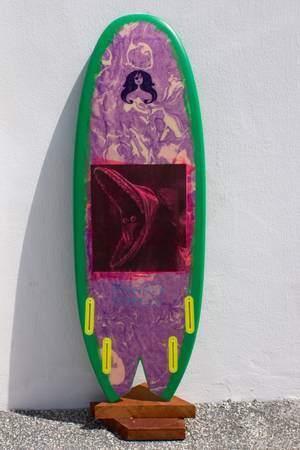 Board Riders Review got to ride a 5’8 Mini Simmons made by veteran shaper Joe Bauguess in collaboration with surfer Richard Kevin. Sick shape from Ryan of Canada, nice one bro. I am digging rail on backside drop if I don’t keep my weight towards the back of the board. 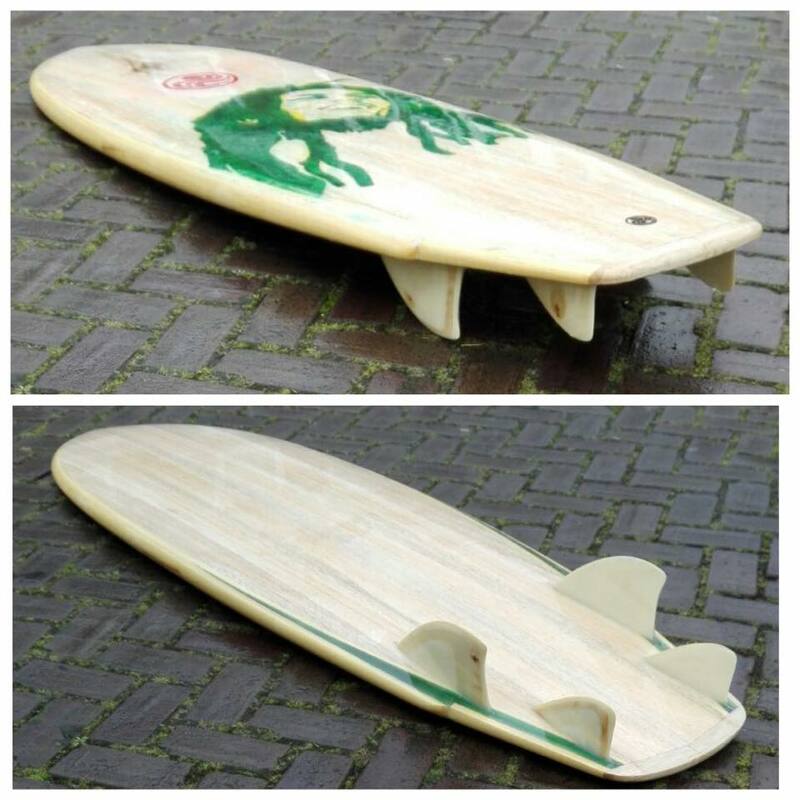 A couple of my friends who ride a mini also noticed the same thing with their boards. One has a quad,the other a twin fin. Doesn’t happen on front side. As long as I remember to keep (or sometimes manage to keep) the weight more on the back, no problem. SO,anyone else on this forum noticed this? We surf in Hawaii,and in solid overhead surf,and the mini simmons are a blast to ride. Our rails are fat on some minis, thinner on others, so I don’t think it is a rail design, but maybe I am wrong. Barry Snyder . . . I too have had that problem. Those boards really want to slide and not go on rail. 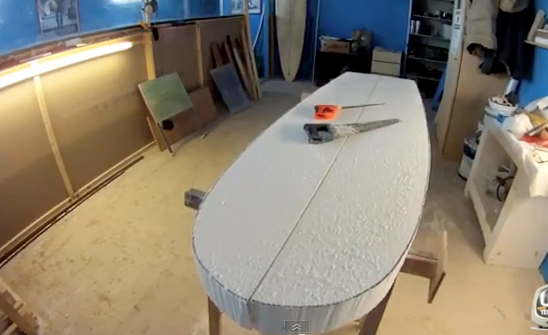 That’s why surfboards have evolved to what we have today. (more rocker). To solve this problem I have gone asymmetrical. Less pressure required to engage board. If you ever get the chance to ride one, do it! This is my personal board. Left rail is my heel side. More “Vee” in tail also helps. Never had a problem going backside. 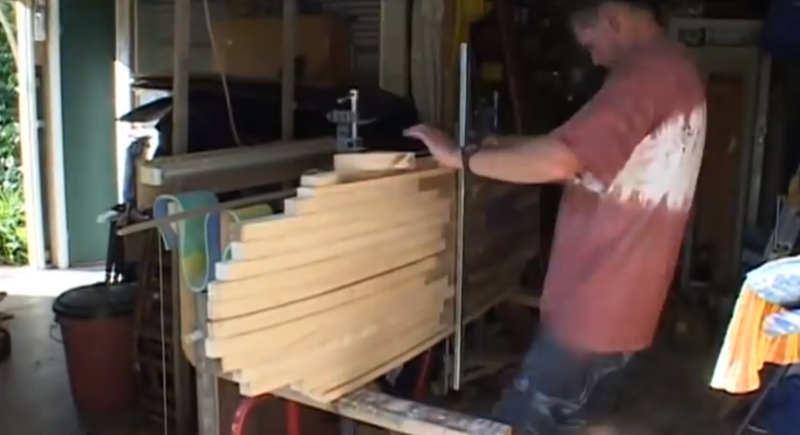 I’d recommend sharp rails in the back and some nice slight slopping rocker in front. Also, I wouldn’t touch the bottom, forget all this tri-plane, concave, etc talk . . . smooth entry and smooth release. 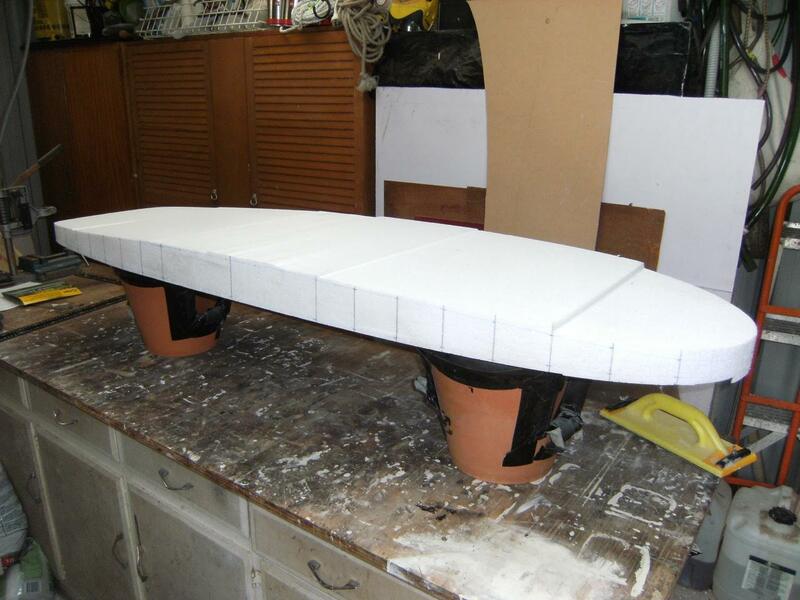 I have shaped them every-which-way and the less I touch (shape) the bottom the better. 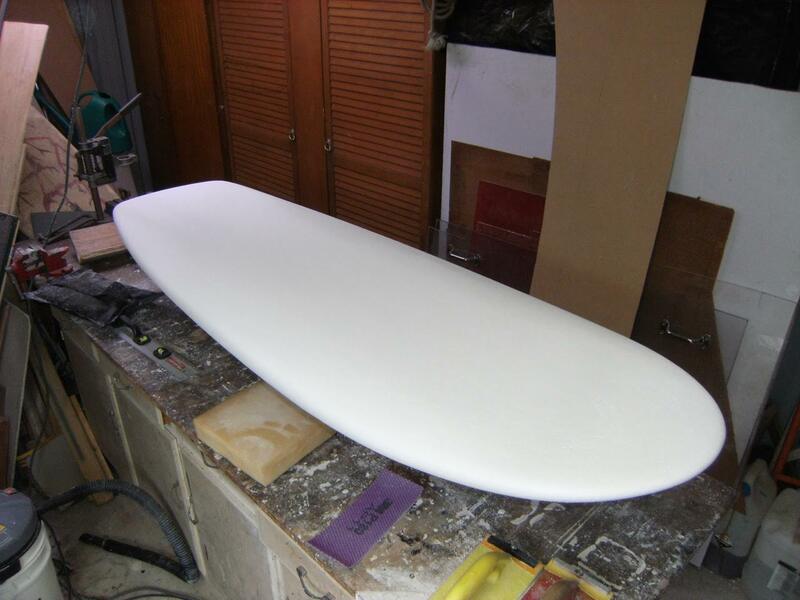 One of thing that will really influence your backside (the fins). Too big and it will feel like you are turning a semi truck. Keep them small and low. 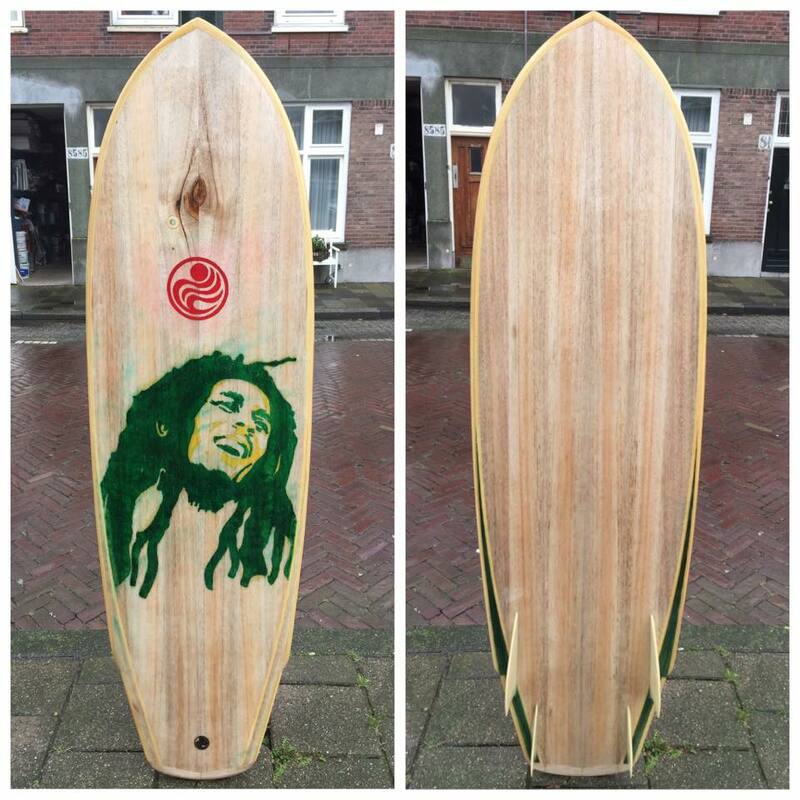 Life is too short to ride just one board. I like thick wide boards. I cut em out with a worm drive saw. My rail bands are sloppy. 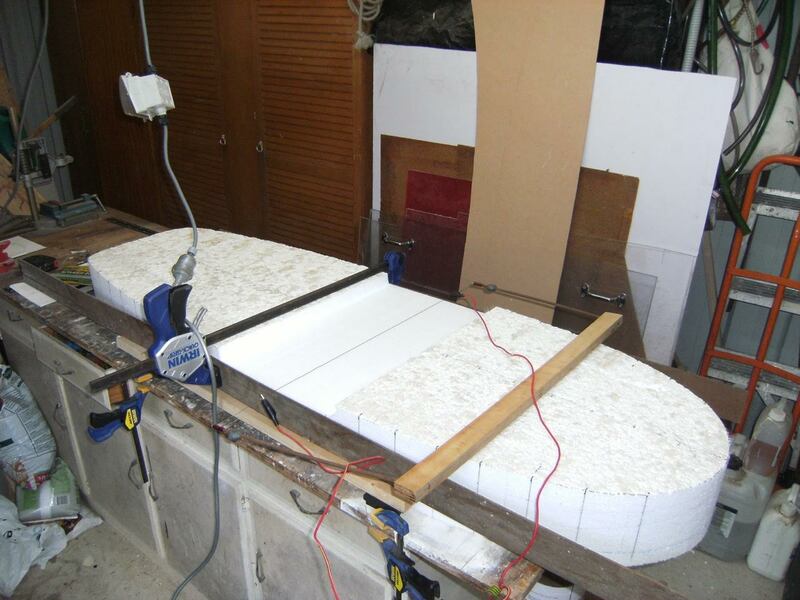 I use a power sander. I finish sand with 60 grit. I used to be a “Pro”. Scott Kennedy . . .
You have discovered the chink in the mini’s armor – backside surfing. 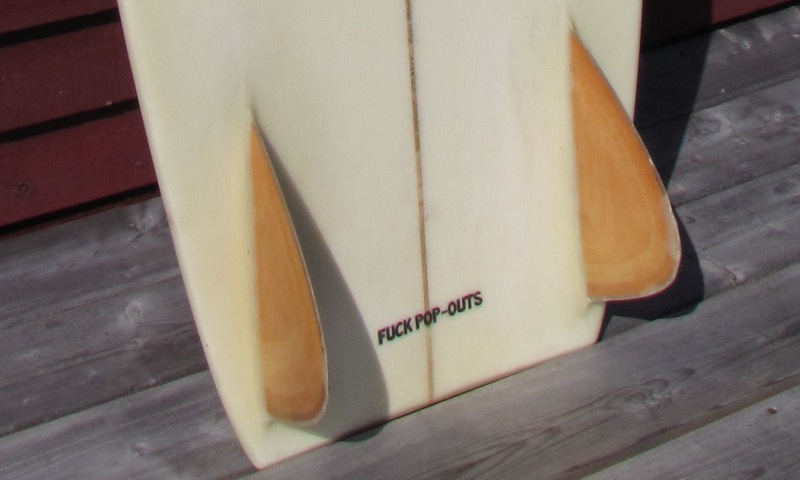 Go asym, or only surf front-side on em. Rocker numbers from an early one I saw were around 4″ nose and 0″ in the tail. I used that on mine and it never digs. Also, I have snowboard-sharp rails up to about half a foot forward of the fins, after that it releases into a sharp 50/50 style rail (sharper apex) up the nose. 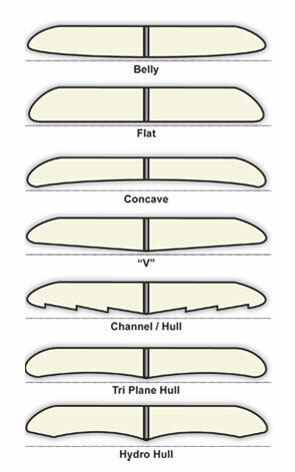 Tri-plane hull is essentially a board with three ‘contact points’ on it. 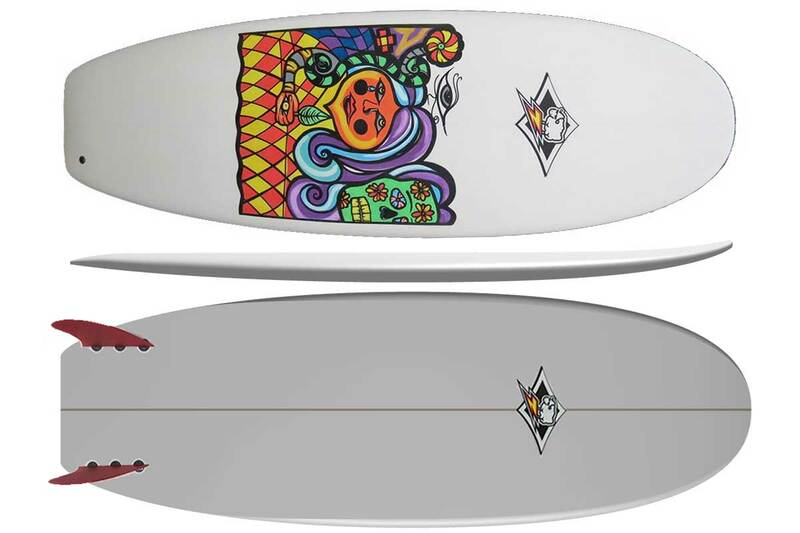 Basically, its a double-concave with a high “vee” on the stringer line, and flat points on either side of the concaves. 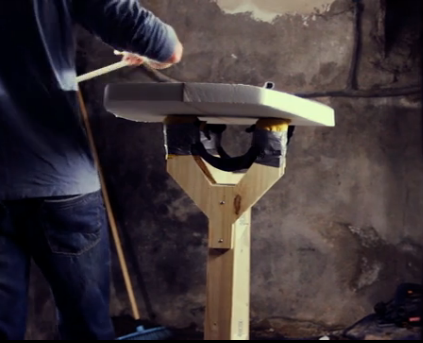 The vee sits slightly higher than the flat points creating a jumpy edge-to-edge feeling. I find it helps a lot with the grabbiness going backside because it makes it easier to release the backside rail with quick pumps so it doesn’t bog down.